Rico CASAZZA Transmutation (Kirk Degiorgio, Aubrey mixes) vinyl at Juno Records. 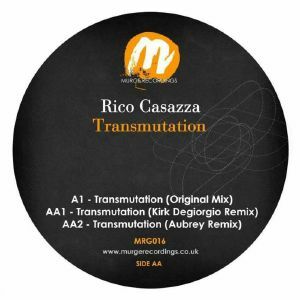 London based Rico Casazza has been sliding out warm, harmonically rich techno for over 10 years now, shoring up on labels such as Bonzai Elemental, Archipel, Stock5, Cartulis Music, Variance and more. On his latest release, which lands on sterling techno imprint Murge Recordings, he's channeling the spirit of Detroit in a plush spread of warm and expressive synth shapes. "Transmutation" is strong in its original configuration, but it's also propped up by some classy remixes from big hitters. Kirk Degiorgio steps up first with a tense, darkside techno workout for the peak of the night. Aubrey then pings things up into a trippy, heavy-rolling workout drawn from the freakier end of the spectrum.